We are cooking spring pasta for Easter this year. I decided to make a kid friendly option same as my mom was used to offer during Holy Week celebrations. Sometimes it is difficult to inspire our children to eat veggies but when presented in a fun way can help with the daunting task of making something that will entice their tastebuds. 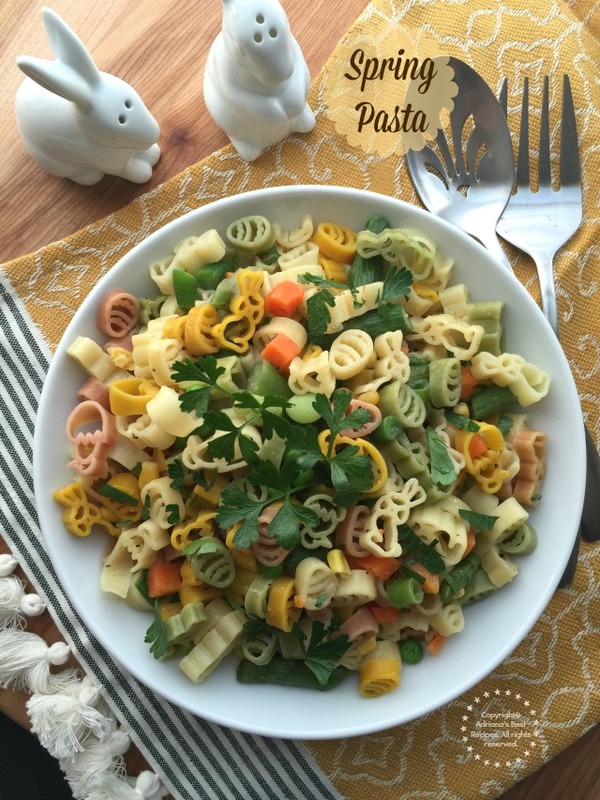 Pasta shaped in fun forms like bunnies and Easter eggs is a great way to incorporate vegetables to kids meals. 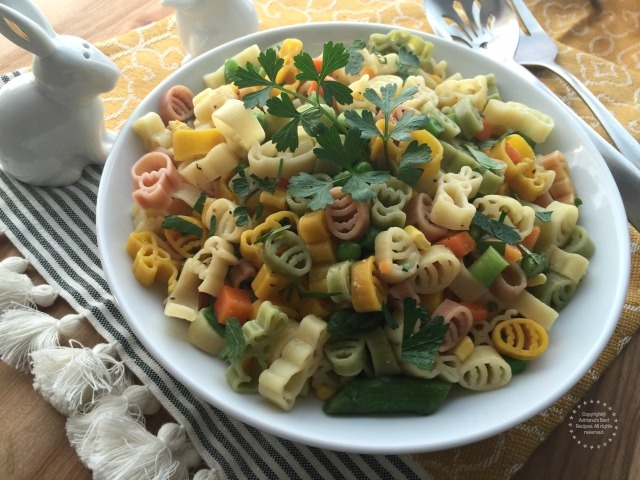 In this spring pasta recipe I am using frozen asparagus tips and mixed veggies such as corn, lima beans, green beans, peas and carrots. And to flavor the pasta using butter and simple spices like seasoned salt and a pinch of oregano. 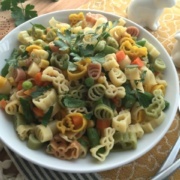 In this spring pasta recipe for Easter I am using frozen asparagus tips and mixed veggies such as corn, lima beans, green beans, peas and carrots. As well as butter and simple spices like seasoned salt and a pinch of oregano. Cook the pasta for 5-7 minutes on boiling salted water with cooking oil to avoid sticking. When the pasta is ready temper with cold water and strain. Cook the frozen veggies with 1/2 stick of butter and the spices in the microwave oven. Then add the cooked veggies to the pasta and fold. Finish with chopped fresh parsley and serve hot. You can garnish the spring pasta with parmesan cheese if desired. The spring pasta dish can also be a nice complement to a meal served alongside a baked ham, rotisserie chicken or a beef or lamb roast and a fresh salad. Kids have very sensitive tastebuds, because unlike adults they are still developing their taste and sometimes certain ingredients that for us taste good for them the taste is too strong. Using simple flavors helps while introducing new ingredients to them alongside familiar dishes like pasta. 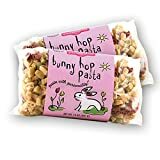 When I saw this Easter pasta embracing the theme of an Easter egg hunt and the bunnies immediately thought would be a great idea to add as one of my options for my Easter menu. Adding a fun dish that for the adults will bring a smile and the kids will appreciate is part of the success. I wonder if you have experienced this, but often during the holidays or when we have parties at home the children never want to eat so having something attractive for them in the menu it is a good idea so that they are enticed to eat not only dessert. This spring pasta flavors are inspired in the traditional Italian dish for “la pasta primavera” which is very tasty and can be finished with finely shredded parmesan cheese if desired. The spring pasta dish can also be a nice complement to a meal served alongside a baked ham, rotisserie chicken or a beef or lamb roast and a fresh salad. 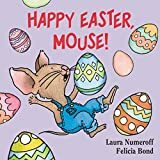 I hope your Easter celebrations are blessed and joyful. 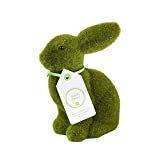 Peter Rabbit Italian Pasta for Easter Spring 17.6 Oz. This is SO cute, and perfect for Easter!! Best of all, easy to make!! That is the cutest pasta! I’m jealous!! Con lo que me gusta la pasta!!! Se ve delicioso! Oh my goodness, that bunny shaped pasta is too adorable! Now I’m going to be on the hunt for it! This looks amazing!! Love the bunny shaped pasta, it gives the recipe a super fun look. Thanks for sharing. Esta pasta si le va a encantar a Jax y se ve deliciosa! Pero qué cosa más linda esta pasta! Me encantó quiero servirles esta receta a mis chiquitas! Va con zanahoria? Digo por los conejitos ???? What a cute idea!! Do they make holiday-inspired pasta year-round? I had never seen these. Many thanks, this pasta I found at a specialty store that sells a lot of seasonal products. Luce bien rica, la hago este fin de semana! Mi mama acostumbraba a llenar de verduras la sopa de pasta, creo que esa era una de las mejores maneras para comer nuestras verduras. Yo también lo hago con mis hijos y esta pasta con huevitos y conejitos es además muy atractiva para la temporada. The pasta itself is adorable! I love the Easter themed shapes, the kids will do too for sure! Thanks for sharing your recipe, it looks light, perfect for Spring weather! Muy linda la presentación, me encanto la pasta en forma de conejitos. I love this idea! I had never seen this kind of pasta before. Now I know what I’m making for Easter Sunday. My kids are going to love it! Oh my goodness that pasta is cute! Love what you’ve made with this light, bright meal. I appreciate the face you’re using some freezer staples too! Such adorable pasta! 😀 I love that you made this with frozen ingredients – makes it so much easier to whip it together without a special trip to the store. I love pasta with asparagus in the spring and so do my kids. This is a great dish for Easter! Hey Adriana. Never known about frozen asparagus tips – I have to go looking for them in Australia. And never thought about adding it to pasta. I am going to start thinking of using this vegetable in pasta. Don’t you love when something just clicks. Great recipe. Thank you . Rachel. Hmm looks so good. Perfect for dinner! I want to try it. Thanks for the recipe! these noodles are SO cute! My kids would absolutely love this and I love all the flavors! Easter pasta! I’m on my way over! This is fabulous! I’ll bet the kids dive right in and don’t even notice the veggies! 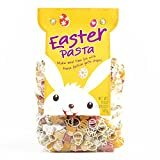 This Easter pasta is so incredibly cute! I love this kind of recipe with lots of veggies. I love those pasta shapes! So festive and almost too cute to eat! Love all the veggies too. How cute!!! I haven’t seen the different shape pasta but I’ll keep my eyes open for it. I like the ingredients you used along with it. Yum! I don’t think any child could resist this. That Easter-shaped pasta is so cute. What a fun way to add a little something special to your Holy Week meals. 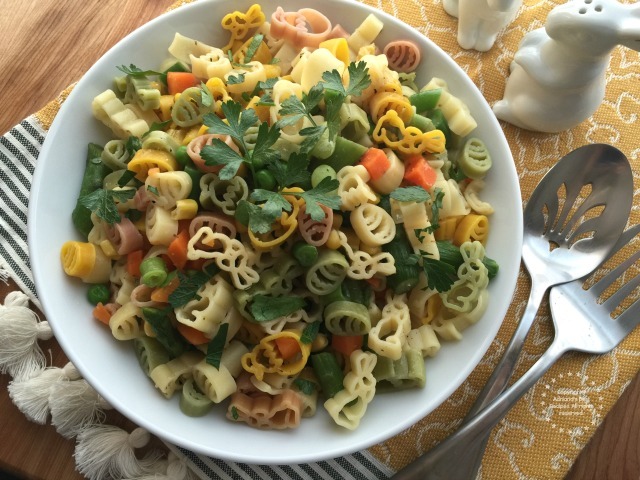 The Easter shape pasta is such a cute idea. I’ve never seen it but it would be perfect for Easter dinner. Love how you added asparagus to this also. Love this Easter egg shaped pasta! It reminds me of being at home in Texas and I could readily find pasta shaped like the state of Texas!! Oh my gosh – these are so colorful and cute.. I wish I got them here. My kids would LOVE this. So pretty – I love the sound of spring. Can’t wait for it soon. Oh my goodness that is the cutest pasta ever!!!! I want pasta shaped like bunnies!!!!! When my kids were younger they used to have dinosaur pasta, but that was no where near as cute!!!! And I love all the spring veg in this, it sounds perfect for Easter! Those pasta shapes are so darling! 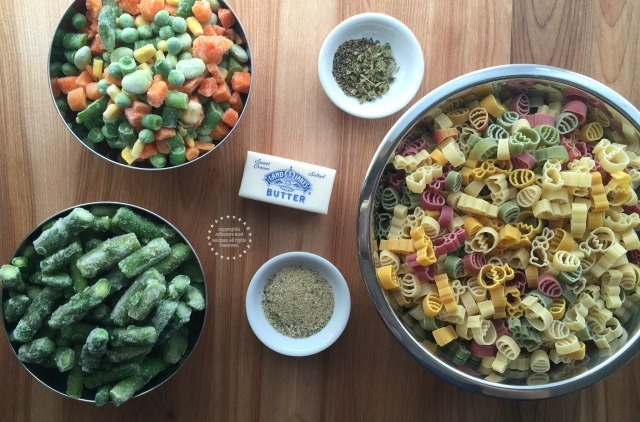 I love all the veggies in this pasta dish too – especially the lima beans – YUM! awww cute pasta, quick recipe too!!! Love it! OMG, Such cuTe looking pasta! You’re right, my daughter hates to eat her veggies…unless it’s salad drowned in ranch dressing. I’ll have to make this for her…much healthier. Yum! 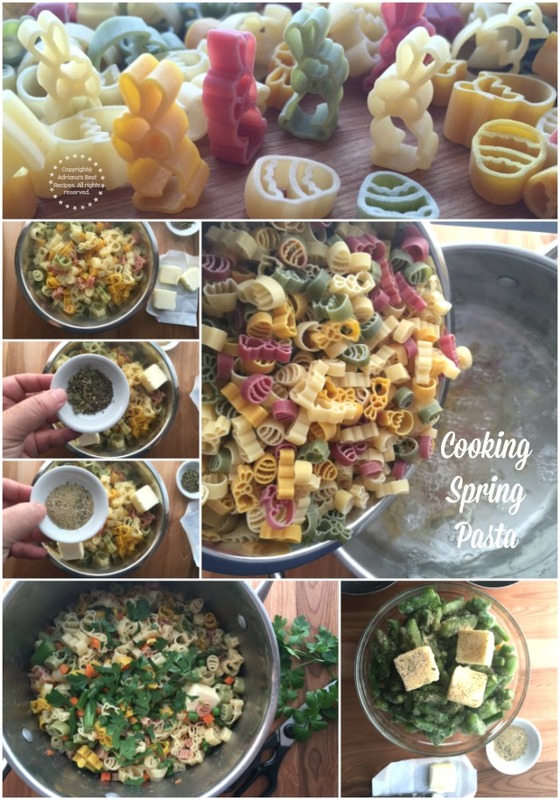 This spring pasta looks delicious. Definitely need to make this for my family on Easter! Que linda pasta !! Los pequeños conejitos. Le voy a hacer a mis peques que les encantan las sorpresas.